[LOS ANGELES] 5.18.2014. On Thursday, 5.15.2014, nearly two dozen activists protested the possible loss of net neutrality outside the FCC headquarters in Cerritos which is a suburb just outside Los Angeles. The OtFCC was organized by Lauren Steiner. 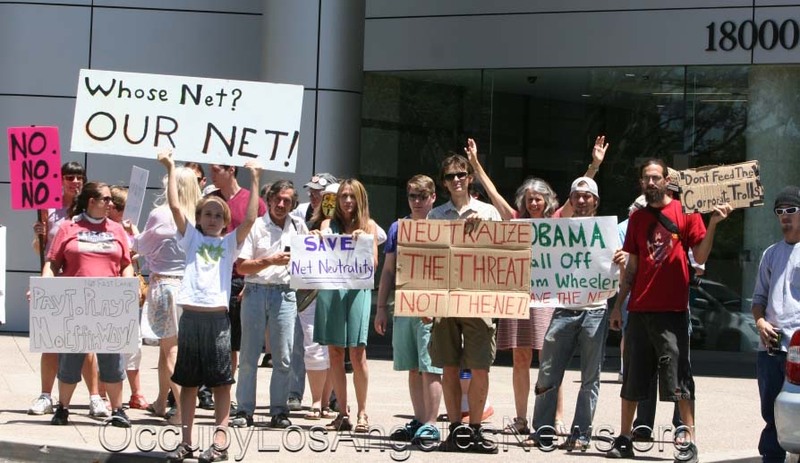 However what the protestors didn’t know is that the courts already struck down all FCC net neutral laws at Verizon’s request back in 2010. 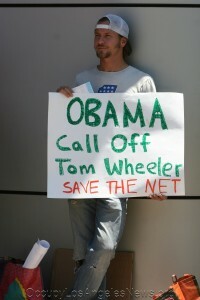 OtFCC are protesting in particular FCC Commissioner Tom Wheeler. Mr. Wheeler and the majority of the FCC’s commissioners believe Internet giants like Verizon, Time-Warner, Comcast and others need regulating the way gas and electric utilities are regulated. There are no “net neutrality” laws in the United States – period. 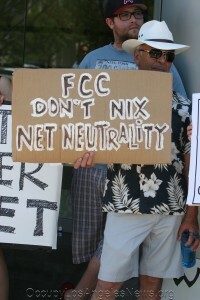 To change that, the FCC held discussions in Washington DC on 5.15.2014 to address this need. 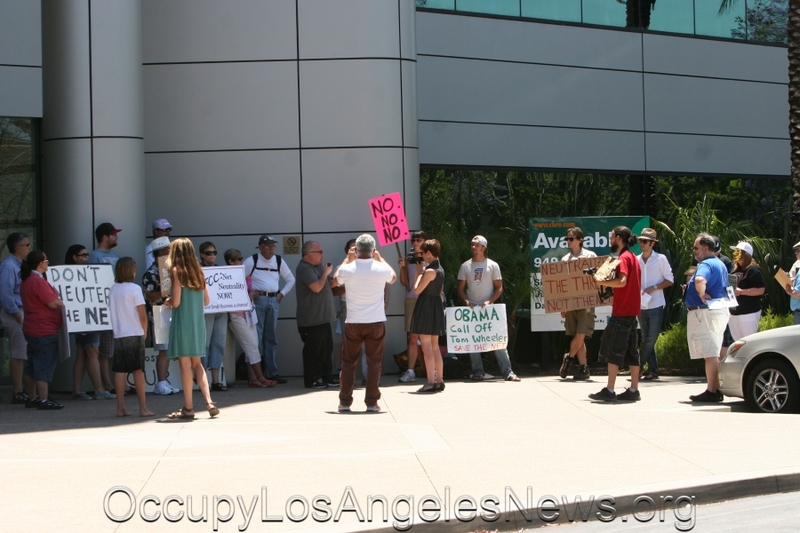 Their move prompted protests across the nation including this one in Southern California. 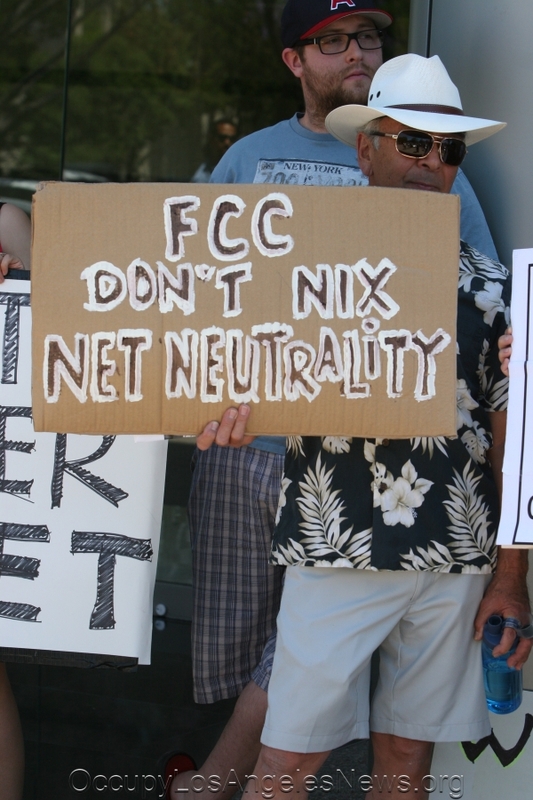 The commission’s Washington meeting opened the start of a four month conversation period which it is asking the public for comments on the FCC’s newly proposed net laws. Should Internet giants like AT&T, Verizon, Time Warner and Comcast and others be regulated as gas and electric utilities already are? Should companies be prevented from slowing down the Internet for some and speeding it for others who pay more? 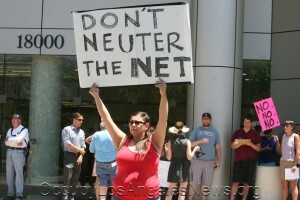 The FCC says yes and no. Verizon’s website now offers many tiered speed plans to choose from. They range from 5 megabits per seconds all the way up to 150 megabits per seconds for internet access speeds. A megabit is the amount of computer storage or digital information that can be transmitted over the web and it is a mean of measuring digital information’s transfer rates. Verizon’s upper class tier is 29 times faster than their lowest class counterpart (150mbps v. 5 mbps). All Verizon’s web traffic travels over the same fiber optic lines. Verizon has, in essence, created a super highway with a super fast lane for the 1% and many slower lanes for the rest. 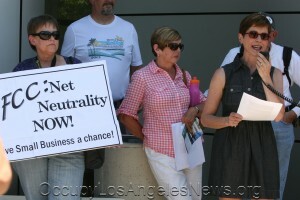 This entry was posted in Cataloged Recent Posts, Occupy Local News, Occupy National News and tagged Comcast, FCC Rally in Cerritos Californa, FCC’s Chairman Tom Wheeler, Lauren Steiner, Occupy the FCC, OtFCC, Time-Warner, Verizon. Bookmark the permalink.